The technology is the same as that of the simple inkjet printer found in homes and offices, but Japanese scientist Makoto Nakamura is on a mission to see if it can also produce human organs. The idea is for the printer to jet out thousands of cells per second – rather than ink droplets – and to build them up into a three-dimensional organ. “It would be like building a huge skyscraper on a micro level using different kinds of cells and other materials instead of steel beams, concrete and glass,” he told AFP in this city in central Japan. “Ultimately I hope to make a heart,” said Nakamura, professor at the graduate school of science and technology for research at the state-run University of Toyama. While Nakamura says it would take him some 20 years to develop a heart, the feat could pave the way to mass produce “good hearts” for patients waiting for transplants. 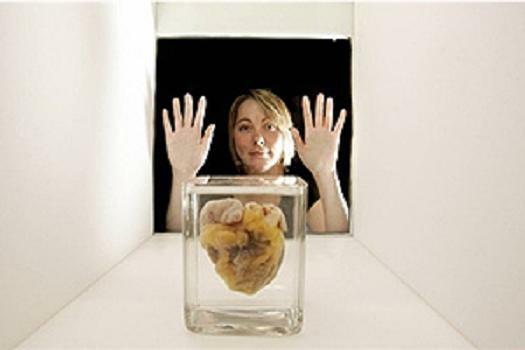 A heart made of cells originating from the patient could eliminate fears that the body would reject it. In the emerging field of organ printing, Nakamura bills his work as the world’s finest printed 3D structure with living cells. The technology works a bit like dealing with sliced fruit: an organ is cut horizontally, allowing researchers to see an array of cells on the surface. If a printer drops cells one by one into the right spots and repeats the process for many layers, it creates a 3D organ. Much like a printer chooses different colours, the machine can position different types of cells to drop. Nakamura has succeeded in building a tube with living cells. It measures one millimetre in diametre and has double walls with two different kinds of cells, similar to the three-layer structure in human blood vessels. He has also made a smaller single-wall hydrogel tube that measures one-tenth of a millimetre – as narrow as human hair. The tubes are made by a 3D inkjet bioprinter that Nakamura’s team developed in a three-year project completed earlier this year at Kanagawa Academy of Science and Technology, a foundation based southwest of Tokyo. The printer can adjust where to drop cells in the order of one-thousandth of a millimetre and produce a tube at a speed of three centimetres per two minutes. Nakamura’s motivation is simple – if there are not enough organs for the people who need them, then scientists should make them. Treating children with heart problems day and night as a paediatrician, he realised there are children who do not respond to conventional treatment or whose condition is too serious to treat. Then 36, Nakamura thought he “shouldn’t just wait” and left a decade of clinical work to be a researcher, in hopes of contributing to medical progress. Now 49, he is married to a former nurse and has five children. Nakamura dismisses the idea of printing brains or trying to create new life. “I’m not envisioning making superhuman cyborgs. There are simply lives that could be saved if there are organs,” he said. He spent years researching artificial hearts but mechanical organs are not yet reasonable alternatives for donor organs. Problems include their inability to generate energy by themselves, make hormones or fight infection. One day Nakamura found that droplets from inkjet printers were about the same size as human cells, which are as small as 10 micrometres in diameter each, or one-100th of a millimetre. He bought a home-use Seiko Epson printer in 2002 and tried to eject cells with it. But the inkjet nozzle got clogged. He rang up the company’s customer service, telling the operator that he wanted to print cells, an idea she politely turned down. Nakamura did not give up and eventually reached an Epson official who showed interest and agreed to give him technical support. In 2003, Nakamura confirmed that cells survived even after the printing process, becoming one of the first researchers in the world to unveil a 3D structure with real living cells using inkjet technology. To prevent the droplets from drying out and to help cells form a 3D structure, Nakamura puts cells in alginate sodium and jets them into a calcium-chloride solution. In the future, Nakamura also said the technology could pave the way for bio-printing with stem cells – which could go into building healthy new organs. “I really don’t know what the future possibilities are, but this technology will be needed in the future to find where to position stem cells,” he said.